The 1031 Exchange name comes from Internal Revenue Code Section 1031. It enables you to defer capital gains tax and depreciation recapture by reinvesting the proceeds from the sale of investment property into replacement property, thus preserving significant wealth in your estate. Your 1031 exchange deferrals can be continued through as many exchanges as you wish. However, when you sell the property without reinvesting in a new property, there will be capital gains and depreciation recapture tax liability. In addition, a 1031 exchange allows you to purchase a leveraged replacement property. This can increase your basis by the amount of additional real estate you purchase and potentially allows for additional depreciation pass-through. This can potentially shelter as much as 50% to 60% of the rental-income cash flow from income taxes. While not guaranteed, on an after-tax basis, we believe the rate of return (ROR) for a 1031 exchange into securitized real estate is comparable to the ROR on investments that may carry more risk. With the possibility of additional return from appreciation of the property, the after-tax return on investment on an annualized basis can be even greater. A tax-deferred 1031 exchange can be a powerful wealth-building tool. However, we highly recommend you consult a professional tax advisor to ensure that you meet every requirement of Internal Revenue Code Section 1031. Failure to meet requirements can result in immediate tax liabilities and associated penalties. In addition, you must follow—to the letter—the strict timeline and procedural requirements for a proper 1031 exchanges. 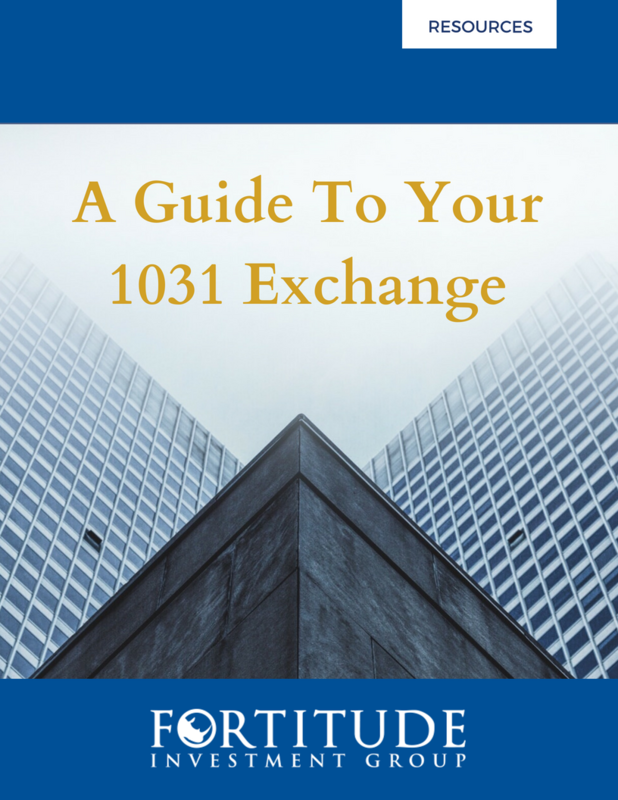 To learn more, check out our 2 helpful resources: A Guide To Your 1031 Exchange and our 1031 Exchange Checklist. It is absolutely critical to follow the requirements for 1031 exchanges to the letter in order to realize the investment benefits and avoid costly penalties. The exchange process must be facilitated by a Qualified Intermediary (QI), the professional who actually executes the exchange. QIs hold the proceeds from the property you sell until they are reinvested in the replacement property. There must be a written “exchange agreement” between you and the QI to prevent you from having “constructive receipt” of the funds during the exchange period. The QI is required to complete a valid 1031 exchange that ensures all roles are followed and equity is preserved during the process. Using a QI as an independent third-party to facilitate a tax-deferred exchange is a safe harbor established by Treasury Regulations, and it is very important for you to select a QI before closing on the sale of your property. We can work with any authorized QI of your choice, or we can suggest one who is fully bonded and has a national reputation. The properties involved must be “like-kind". This requirement is liberally interpreted, and virtually all real estate properties, whether raw land or those with substantial improvements, qualify as like-kind. However, REITs, real estate funds or other securities do not qualify for 1031 exchange. 95% Rule: Identification of any number of properties regardless of the aggregate FMV, as long as at least 95% of the property is ultimately acquired. You must also close on the replacement property or properties within 180 calendar days of the closure for the relinquished property. You must hold the properties for productive use in a business or for the purpose of investment. The replacement property must be of equal or greater value than the property you sold. The equity of the replacement property must be of equal or greater value than the equity of the property you sold. It is important to note that you CANNOT replace equity by acquiring more debt (with the exception of a 1033 Exchange). The debt held by the replacement property must be of equal or greater value than the debt held by the property you sold unless you offset lower debt on the replacement property by adding cash to the exchange. Investor – an accredited individual, trust, partnership, LLC, S corporation, and/or C corporation. Sponsor Due Diligence – The sponsor finds the most attractive investment-grade properties and performs extensive due diligence for each. If satisfied with the results, the sponsor acquires or contracts to purchase the property and the offering is initiated. Arrangement for Debt Financing – Once a property for acquisition is identified, the sponsor arranges non-recourse debt financing with a major lender, which performs its own due diligence. The loan is made in whole to the sponsor and is assumed by the investors as a non-recourse loan according to their proportionate share of the offering. Loan repayments are made by the property manager or the asset manager, which is usually the sponsor. Preparation of the Private Placement Memorandum – Once the debt is negotiated, the sponsor structures the equity component of the acquisition through a private placement offering. This requires the sponsor to retain legal counsel to write a Private Placement Memorandum (PPM) discloses all risks and material facts related to the offering. Signing the Selling Agreement – Once the PPM has been prepared, the PPM and all information used in underwriting the offering is presented to a FINRA member securities broker dealer. 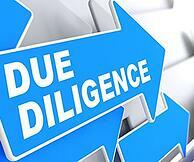 The brokerage conducts its own due diligence on the sponsor and the property before signing a selling agreement. This adds another layer of protection for the investor. Presentation to Prospective Investor – Once the selling agreement is signed by the broker dealer, its licensed, registered representatives can present it to prospective investors. DO Plan in advance. It’s the key to success in any exchange. Pay particular attention to the timing of the sale of the property you’re selling, estimating equity and debt replacement objectives to avoid boot, and retaining an expert QI (qualified intermediary). DO Make every effort to sell before you purchase. If you identify an ideal replacement property before you sell, you may need to negotiate a reverse exchange (i.e., buying before selling). The IRS has guidance on this in Revenue Procedure 2000-37, but either the replacement property or the sale property must be parked with an Exchange Accommodator Titleholder for 180 days, pending the successful completion of the exchange. DO Be mindful of the “napkin test” in a balanced exchange. If you are trading down in total value, you are potentially taxable to the extent of the trade-down. If you are trading down in equity, you are potentially taxable to the extent of the trade-down. DON’T Miss your deadlines. The IRS will not honor the exchange if you miss the 45-day identification period or if you do not acquire the replacement property within the 180 day exchange period. DON’T Change how title is held during the exchange. Changing how title to your property is being held or dissolving partnerships during the exchange may cause the exchange to be dishonored due to holding-period issues. The Delaware Statutory Trust (DST) and Tenancy in Common (TIC) are the two most common ownership structures for investors who would like to access investment-grade properties together with other accredited investors. Both can qualify as a like-kind interest in real estate for the purposes of a 1031 exchange. The TIC structure dates back to English common law and has been the traditional vehicle for multiple-owner 1031 exchanges in the US. In the last 10 years, most investors have begun using the DST structure. It is considered a simpler, more flexible vehicle for owning investment real estate with some tangible advantages for the investor. Both DSTs and TICs are usually available as turnkey, pre-packaged investments, with management and non-recourse financing in place. Therefore, they offer superior efficiencies in the identification, acquisition, financing, closing, and operating stages of real estate ownership. These efficiencies are advantageous and often critical if you face strict time restrictions for funding the investment through a 1031 tax-deferred exchange. In addition to DSTs and TICs for a 1031 exchange, you can consider the options of oil and gas offerings designed for this purpose. If the strict timeline and procedural rules are not followed, the 1031 exchange may be disqualified. The full scope of your tax-related risks can only be determined in consultation with your personal tax advisor, who should have full knowledge of your tax situation and the specific laws of the state in which you reside. Contact us should you have any questions. 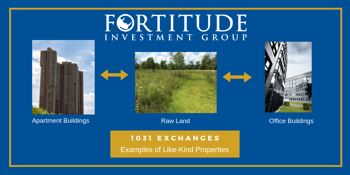 Fortitude Investment Group is committed to helping investors pursue their financial goals through securitized real estate investment structures such as Delaware Statutory Trust (DST) and Tenant in Common (TIC) offerings for 1031 exchanges. We offer professional assistance in identifying and closing on securitized real estate investments that meet your objectives and satisfies your 1031 exchange requirements.